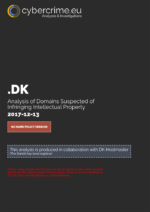 In collaboration with DK Hostmaster A/S (The Danish top level registrar) we have made a complete examination of the 1,324,239 Danish domain names. A total of 43,767 webshops was detected and out of them, 0.12% (51) was detected as webshops Infringing Intellectual Property Rights. 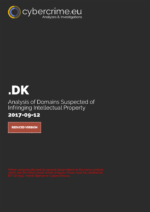 The analysis found 3,075 domains suspected of infringing intellectual property. In the meantime, DK Hostmaster A/S has implemented a new process for validating Danish and foreign customers’ identity. As part of this, all of the existing foreign customers of DK Hostmaster has been evaluated and 2,814 customers has been asked to document their identity. This has subsequently led to the deletion of 2,781 domain names. 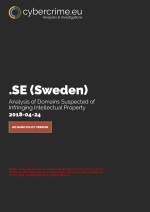 The analysis found 453 domains suspected of infringing intellectual property. Furthermore has DK Hostmaster A/S implanted a risk-based assessment of the information supplied when a domain name is registered. Read more about the risk-based assessment at: dk-hostmaster.dk. Data provided by EIT DK ApS / Henrik Bjørner. 1,701,985 active domains found. 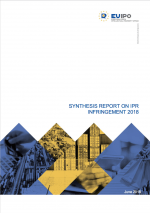 A total of 39,486 web shops were detected, of which 13.55% (5,349) were identified as web shops Infringing on intellectual property rights. In December of 2016, EUIPO (European Union Intellectual Property Office) – A similar analysis of the Swedish domain name system was made. Data for this report was provided by EIT DK ApS / Henrik Bjørner. 2,157,008 active domains found. A total of 60,250 webshops was detected and out of them, 1.50% (920) was detected as webshops Infringing Intellectual Property Rights. 29 January 2018, EURid suspended 25,756 domain names that had ties to identity fraud. 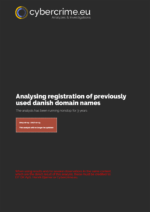 In collaboration with DK Hostmaster A/S (The Danish top level registrar) we have made a complete examination of the 1,325,435 Danish domain names. A total of 43,323 webshops was detected and out of them, 1.03% (453) was detected as webshops Infringing Intellectual Property Rights. 13. December 2017 a full analysis of .DK zone was completed, this was made by EIT DK ApS / cybercrime.eu in collaboration with DK Hostmaster A/S (The Danish top level registrar). The analysis found 3,075 domains suspected of infringing intellectual property. In the meantime, DK Hostmaster A/S has implemented a new process for validating Danish and foreigncustomers’ identity. As part of this, all of the existing foreign customers of DK Hostmaster has been evaluated and 2,814 customers has been asked to document their identity. This has subsequently led to the deletion of 2,781 domain names. In collaboration with DK-Hostmaster (The Danish top level registrar) we have made a complete examination of the 1,330,637 Danish domain names. A total of 45,688 webshops was detected and out of them, 6.73% (3,075) was detected as webshops Infringing Intellectual Property Rights. Suspected trade mark infringing e-shops utilising previously used domain names. More than 27.000 Suspected trade mark infringing e-shops found in 4 EU Member States. The fraud detection analysis has been running nonstop since 2014 and look into repurchased deleted danish domains. See all statistics of counterfeit webshops there has been detected. 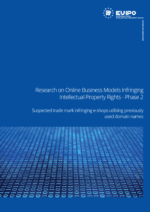 Establishing an overview of online business models infringing intellectual property rights. 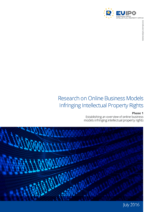 Research study on business models used to infringe intellectual property rights. Data from EIT DK ApS were used in this study. 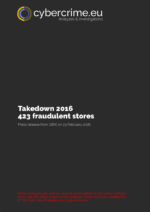 The Takedown 2016 analysis was set up in part to make the algorithm developed by EIT even better at spotting fraudulent stores. 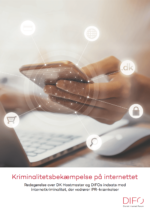 As this is the first operation where authorities have closed down many sites at once since the analysis “Kina på storindkøb” started back in 2014, EIT was obviously somewhat curious in connection with this takedown.